Oh my. What a ride. This almost wordless book is a truly hilarious, spurt-your-coffee tale; one of those books where you see a page and you laugh BEFORE you've turned over to the next page because you just KNOW what's going to happen. A deer is driving along reading a book when BANG! Yes, you can imagine what happens. Behind him is a pig driving chickens, honking his (multiple) horns desperately, and unable to stop in time. BANG! Yes, you can imagine what happens. Next is a giraffe with an awfully long scarf which slips from her neck. As she looks back to see it fly away--BANG! Yes. That's right. As each subsequent animal drives up in their automobile, a new and very funny complication unfolds. I loved 'predicting' in my mind what might become of the truck full of fruit and vegetables, the convertible jammed with crying baby bunnies and the gecko driving a stack of coloured paint cans. 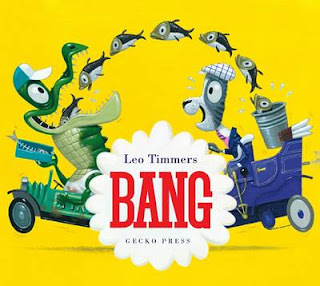 Sheer genius in creativity and also illustration, both children and adults will marvel over Timmer's absolutely stunning imagery, and the clever and brilliantly-thought-out way he combines the elements of each new vehicle into one rather chaotic scene. Splashed over a quadruple-page pull-out, this scene features so much to look at, the eyes boggle. In a good way. A brilliant picture book, for kids aged 2 to 200.